Purchase a Book! Don't forget to let me know if you want it signed to someone in particular. If you would like the book signed, to whom is it for? I love nothing more than learning from top chefs, sharing their recipes and techniques and making them accessible for you, the home cook. I travelled the nation and collected traditional American comfort food recipes from 100 of America’s best chefs and transformed them into a book of 100 plus recipes. Simple, delicious recipes for America's favorite comfort food - MADE IN AMERICA. Next up I'm tackling healthy food - with LEAN IN AMERICA - asking our best chefs to reinvent healthy delicious food. Made in America: Our Best Chefs Reinvent Comfort Food, features updated classic recipes from the most innovative and remarkable chefs working today. 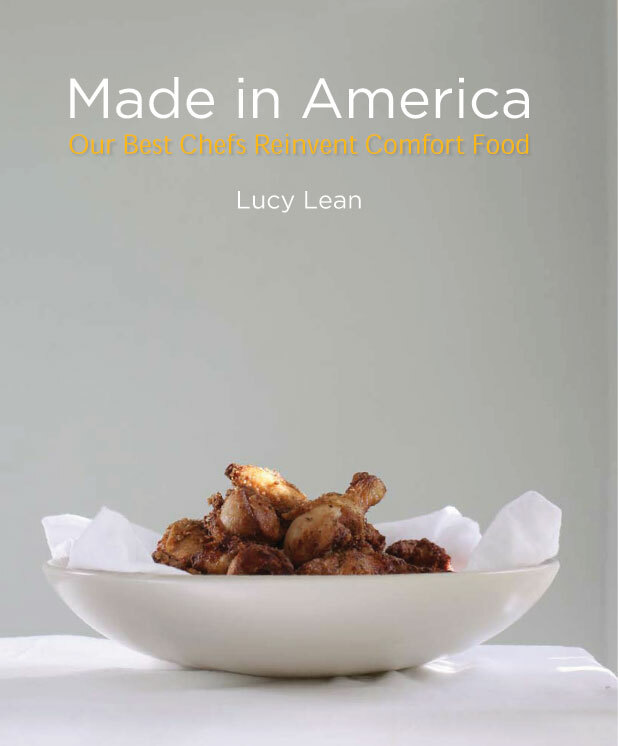 Inspired by turn-of-the-20th century regional American cookbooks, Lucy Lean, former editor of edible LA, has delved through thousands of traditional recipes to define the 100 that best represent America’s culinary legacy, and challenged today’s leading chefs to deconstruct and rebuild them in entirely original ways. The result is the ultimate contemporary comfort food bible for the home cook and armchair food lover. Each recipe is enhanced with an introduction that includes the background and origin of the dish and a unique profile of the chef who has undertaken it, as well as sumptuous photographs of the dish, chef, and restaurant. Chefs from all over the United States have been selected for their accomplishments and talent. From Nancy Silverton’s English Muffins to Rick Moonen’s Lobster Roll, Tom Colicchio’s Chicken Soup to Rick Bayless’ Uptown Chili, from Sherry Yard’s Banana Crackle Pudding to April Bloomfield’s Spicy Ginger Whoopie Pies, Made in America showcases our favorite dishes as conceived by our finest chefs. Please 'Like' the book on Facebook.